Keano San of Evergreen brings the ball up field on a kickoff. It was a long trip and a short stay for Ballard in the state Class 3A football playoffs. The Beavers journeyed all the way to Vancouver on Friday, only to see their season end with a 49-6 loss to Mountain View. Ballard finished with a 6-4 overall record. Chief Sealth, West Seattle and Highline, meanwhile, all saw their seasons end with non-playoff wins and Evergreen came close. Chief Sealth finished with a 43-33 victory at Ingraham on Friday, giving the Seahawks a 7-3 overall mark. West Seattle scored a 31-21 win over Sammamish in its finale Friday and Highline won, 48-16, in a road game against Lindbergh on Thursday. Evergreen led Kingston, 16-10, at halftime in a Friday non-league game, only to wind up on the short end of a 26-16 final. 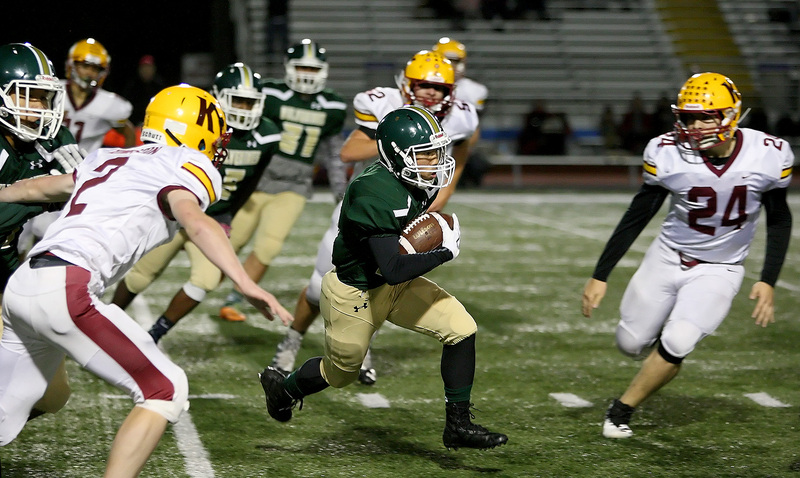 Mount Rainier's season concluded with a 42-0 loss at Bellarmine in Tacoma on Thursday.